Don't be disappointed because you missed out! Tickets are $45. 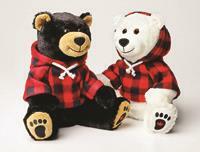 They are available at the BC Liquor Store (cash sales) or from any Rotarian . A SUGGESTION -Click on Gareen's link (left hand column of this webpage). She'll be sure you get some. She's the chairperson for this event. Brilliant sunshine outside, a perfect setting for the good news story told by Doug Thomson, Kitimat Valley Housing Society's spokesman, as plans progress for the Dementia and Alzheimer's Care facility. 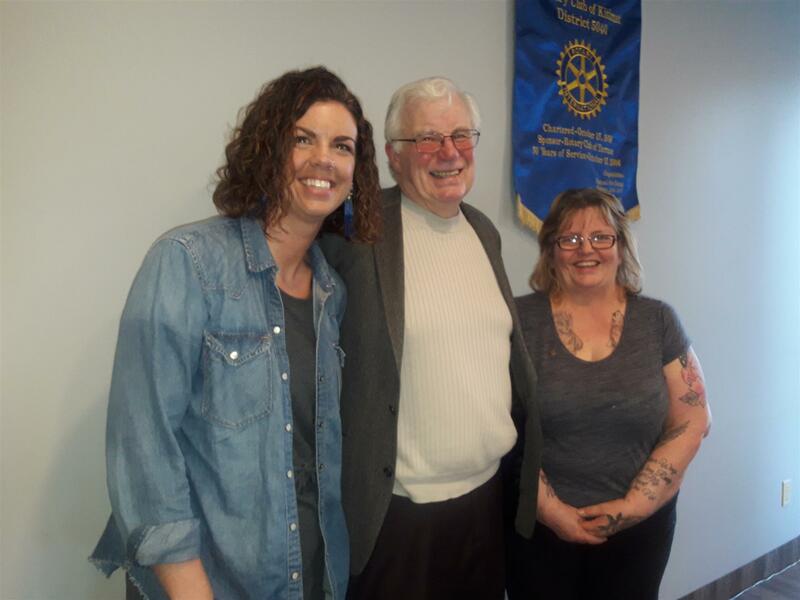 Rotarian Maryann Ouellet introduced Doug, Rotarian Meghan Marshall presented our thanks. One could say the vision here is state of the art, with every aspect considered when looking at the challenges that residents will be facing. The model is a 'circular one' with no end of corridor walls to confuse, exterior walls built wide to improve energy efficiency, open kitchen areas for residents to make their own cup of tea, and specific training using a relatively new method for caregivers geared to allowing residents the means to use their own initiatives. Watching and listening to Doug's presentation, one could not help but think, what a well thought out initiative. Well done to KVHS. 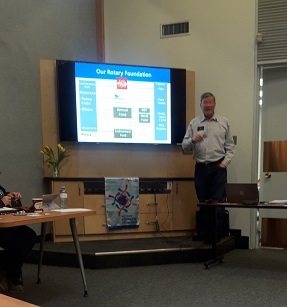 We were also joined by Terrace Rotarian Brian Downie who gave us an update for the weekend of Foundation Dinner, starting the day with the Year Ahead workshop and Foundation Grant the next day. 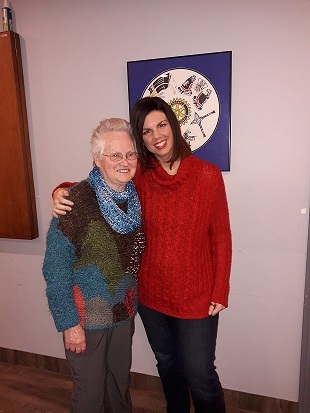 Tuesday, February 26, 2019 proved to be a noteworthy evening for us when we listened to Linda Slanina and Michelle Martin share the work the people do with their organization. There are several programs beyond the service many people know them for - providing a safe haven for women's suffering from abuse. Their presentation described them, then continued with a detailed overview of the project proposed for construction on Quatsino Blvd. 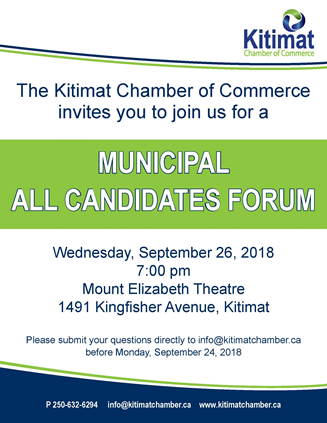 Where exactly it is proposed to be built, what borders the property, facilities that will be provided under one roof, the shelter for women, office space for all their programs, low income housing, transition housing, a cafeteria, furniture exchange, needle exchange and a play area for children. They also shared some of the concerns voiced by people living in/owning neighboring properties. The province has committed 103 million dollars to this project to be used for construction and operating costs once completed. For the most part, people are in favor of what the facility will provide, just not this proposed location. A final public hearing will take place Monday, March 4th at 6:30 p.m. at the Luso Canadian Hall. Thank you from all of us LInda and Michelle for 'telling all'. Sunday the 27th, what an enjoyable afternoon. New members sat back at Eleanor's to see some 'pages' of Rotary picture stored on her computer. The joy of technology was used by having her laptop hooked into the television so the album went big screen We saw club youth projects, club support of Polio Plus, Peace Fellows, guest speakers, international projects, all moments worth sharing. International projects, The Rotary Foundation, fundraisers, District 5040 conferences, Rotary International Conventions and more. It was a good way to see Rotarians in Action. Happy New Year - our first meeting in 2019. To say we started it off with a bang could lead to some questions on best choice of words, we certainly started it off with smiles! Lucy Borges induction 'shone' and we now have pictures. Welcome Lucy. We are thrilled to have you with us. The calendar for the our meetings up to the end of March is set; planning for the balance of the year to continue at our next meeting. Eleanor asked new members if they would like to have a showing of "Rotary moments past'. The answer was 'yes' so the plan was to meet at her place to watch the picture show. What an enjoyable time! In fact so much fun for everyone that our picture taking p.r. gal completely forgot to take pictures!. Cheryl poured the champagne and orange juice or just plain juice for all of us, The coffee was also on, then stratas, fruit salad with yogurt, home made muffins and more. Games followed, Maryanne ending up with the pass the parcel teddy bear. Her immediate Random Act of Kindness was giving it to Jon's delighted son. Seeing his bear hugs and delight is a memory to cherish. Secretary and Treasurer's report were presented and approved. 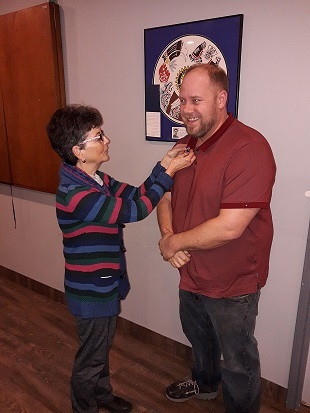 Election of new officer 2019/2020 Rotary Chair - President - Gareen Ball, Secretary/Treasurer - Jo HIldebrandt, Public Relations -Eleanor Kendell, Membership - Cheryl Rumley, Fundraising - Linda Campbell, Sergeant at Arms - Eric Bottah, Foundation - Robin Lapointe. 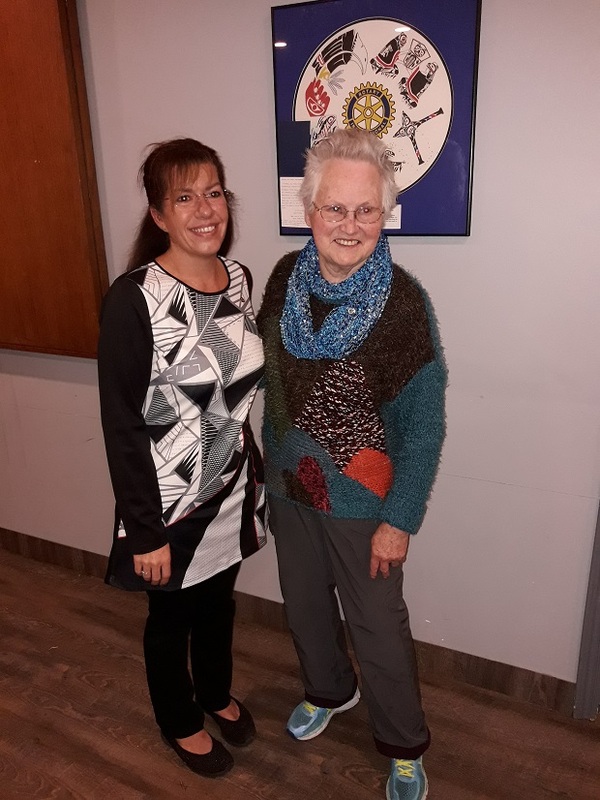 Rotary Connections continued on November 20th with many guests joining us for the evening to hear our guest speaker, Ruth Sulentich. Ruth is the senior consultation and community advisor for LNG Canada. She gave us an excellent overview of the project, the work that is now moving ahead, housing for employees, when to expect to see the plant visibly on site. Fluor Corporation is joint venturing with LNG Canada to handle, engineering, procurement and construction. 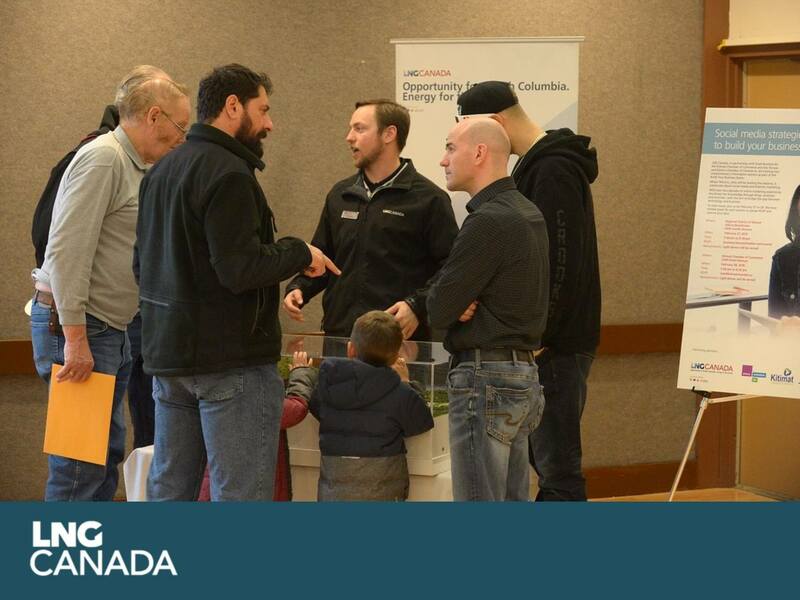 We have since learned LNG Canada and Fluor have established an information centre at the Kitimat Chamber of Commerce. Without question, there was a cheer from all of us when we heard on November 2nd, the project is a go! Our thanks go to Ruth for an excellent presentation and her offer to keep us up to date whenever we may wish her to do so. We finished off the evening by asking guests to share some questions passed out to us by Cheryl. Answers certainly enlightened us about others at our tables AND what fun telling stories. 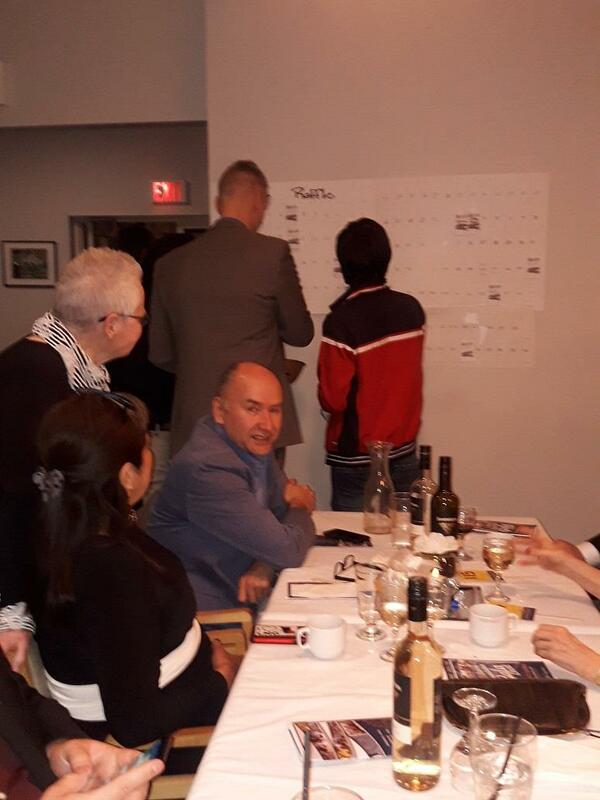 Guests were also asked to fill in the blanks answers to a few questions for Rotary Connections 2. Here we are bundled up in front of the Cenotaph on November 11th, friend Tom Balfour, Eleanor Kendell, friend and MLA Ellis Ross, Gareen Ball and Linda Campbell. Linda placed our Rotary Club of Kitimat on the cenotaph; Gareen recited the words we know so well from In Flanders Field. 2018 was the best year ever for the Aluminum City Telethon. Rounded up total of dollars donation - $134.654.00. Available Rotarians were on the phones answering calls for a normal one hour stint again this year. What an exciting end of day on October 21st! 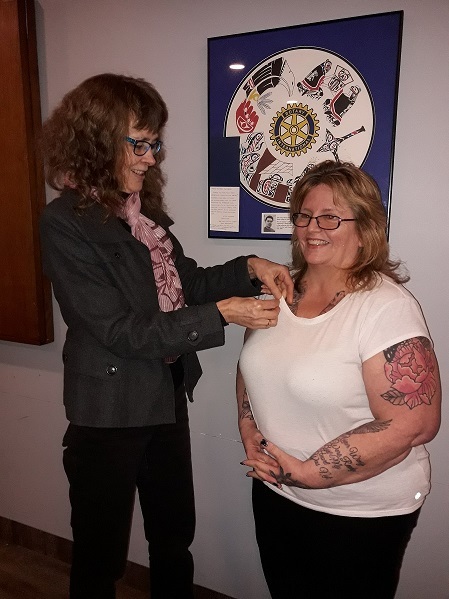 Just after September 21st, Our club's Peace Champion was delighted to receive an e-mail from Janelle Hittel, principal of Kildala Elementary School, Kitimat's first Rotary Peace School. 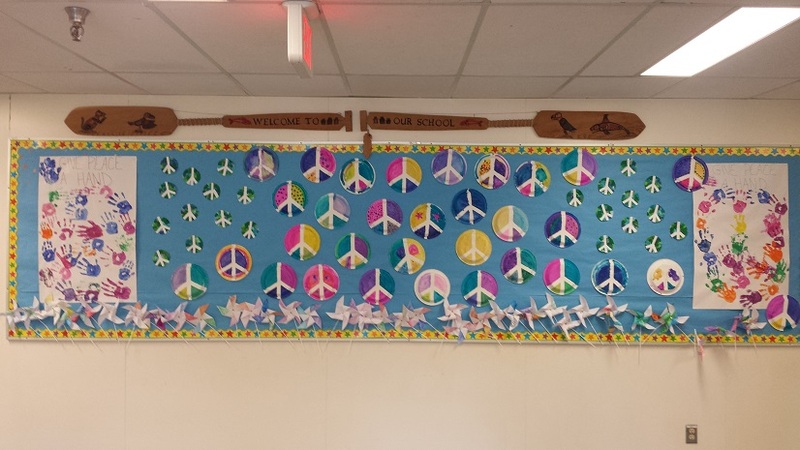 Students has faithfully marked the United Nations International Day of Peace every year since 2011, the year it first met the Peace School's criteria. Here's what she shared, "We did it a bit different this year as our school start-up was different. 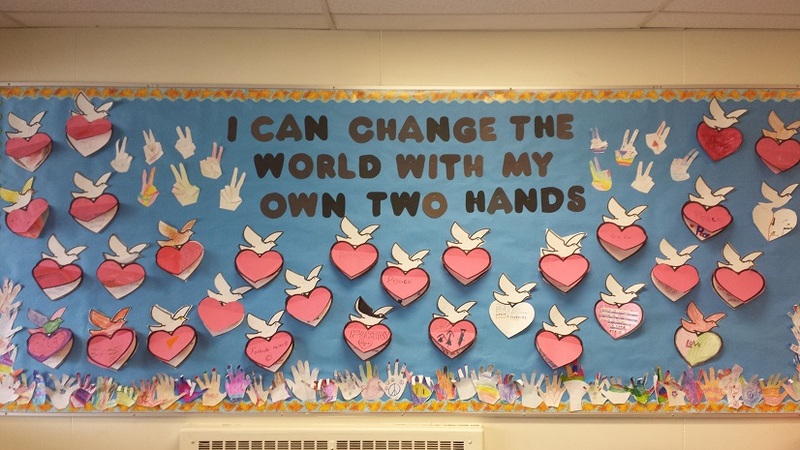 The first 2 days of school the students went into groups and worked on Peace Day activities and read Peace Day stories. We even practiced a Peace Day song to the tune of BINGO. We also painted rocks and added them to our school garden. Just wanted to let you know that Peace Day wasn’t forgotten here we just didn’t do an official assembly this year ☺"
From those of us in Rotary, thank you for remembering peace. It’s a tradition! Every year our Rotary District 5040’s District Governor travels our area visiting the 51 clubs that are included. This covers a significant distance, north to Mackenzie, Bowen Island in the south, Prince Rupert and ourselves in the west. 100 Mile in the east (an attempt to ‘pick’ smaller communities). It was with pleasure that we hosted DG Darcy Long and her husband Doug at a BBQ on August 28th. Their hometown is in Sechelt, population similar to ours 10,000 people. 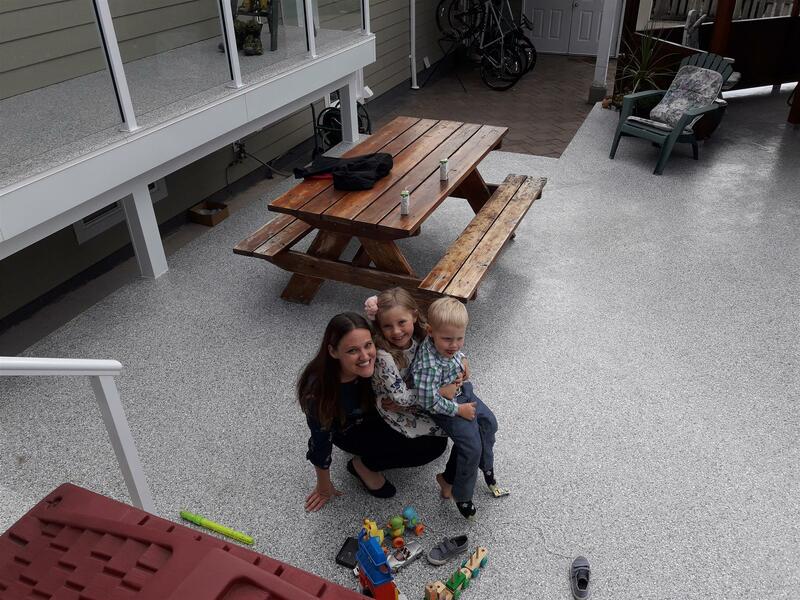 Darcy shared their story, one built on random acts of kindness. Why Rotary? They saw the devastation after the tsunami hit Thailand. What could they do to help? There was a huge sign, six Rotary Clubs of Phuket working together to rebuild the local fishing fleet. A fleet meant small boats, rather like dugout canoes. From this a door opened, the way to help was answered. Rotary helps. 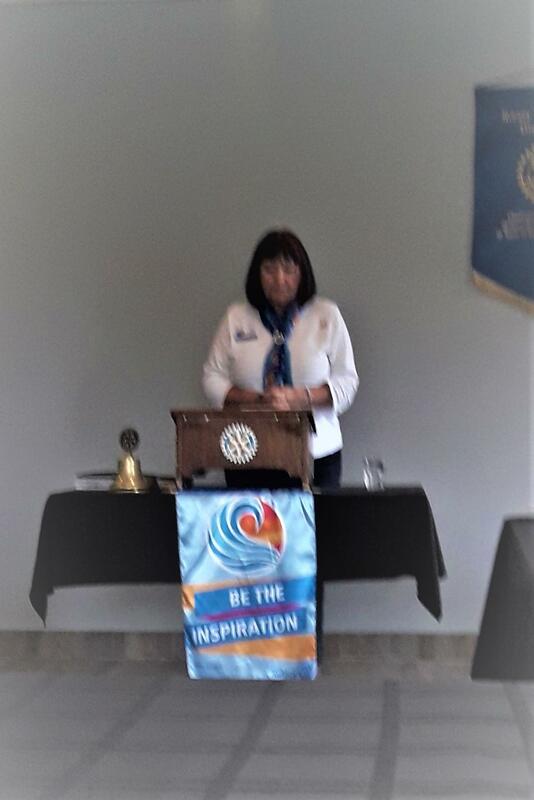 Be the inspiration is this year’s Rotary theme. Darcy is an inspiration. We’ve been invited to be at Sun Peaks for this year’s convention, to continue our efforts with Polio Plus, and encouraged in our efforts to grow Rotary in our hometown. Many thanks go to Robin’s wife Melanie, our hostess for the evening. Everyone pitched in to make the evening special but the big credit goes to her for such a nice evening. The setup on the deck was so inviting! We were joined by guests, like-minded people who have done and continue to do good in our world. Particularly delightful were the children, Jonathon and Melissa's, having fun in the play area that Robin and Melanie have for their granddaughter Elsie. Darcy says she has been inspired making these visits. She will be taking many things to do ideas back to Sechelt to try. Strong leaders are made, not born. Leadership skills are learned, not inherited. With tents setup on the shore at Lakelse, the location was perfect. 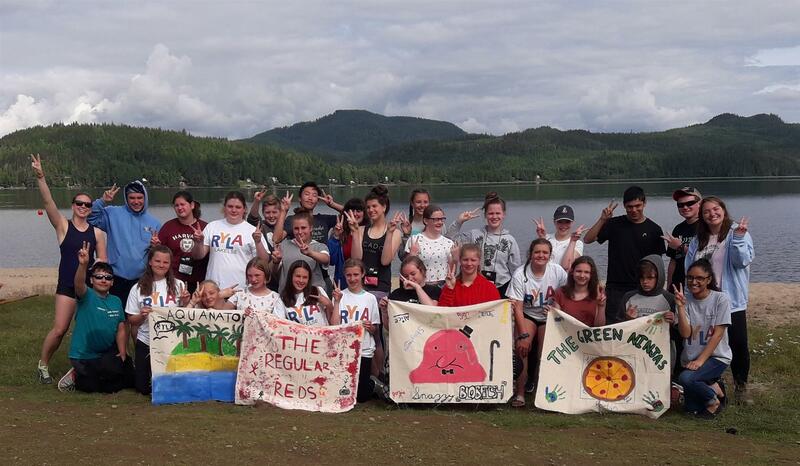 The camp involved students in Grades 8 to 10 with teens, one from far away Vancouver, Prince George, and communities closer to the lake, Quesnel, Prince George, Smithers, Prince Rupert, Terrace, Kitimat come to mind. There were plenty of challenges, exciting activities, high energy, smiles galore. Our club sponsored three honor roll Grade 8 students for the 4 day camp, July 5th to 8th. And what a plus they were! -- Kemper Weightman, Mia Anthony and Shaunhnessy Archibald. 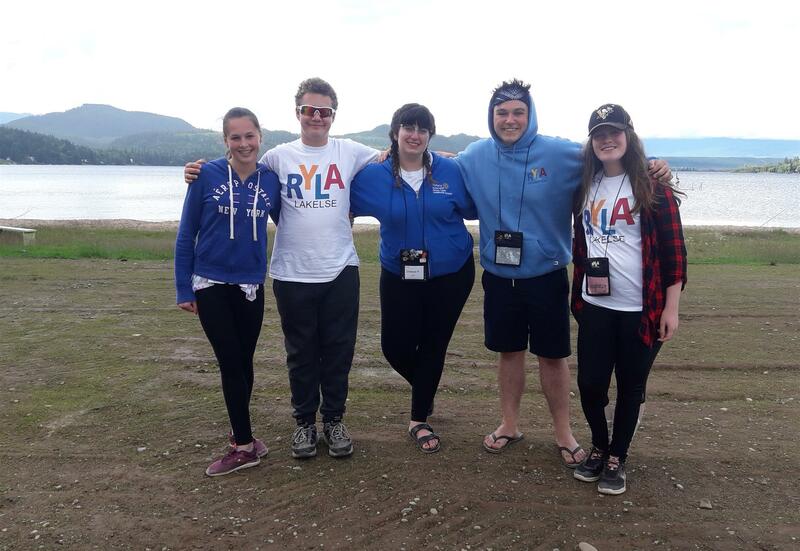 Left to right - Mia, Kemper, camp leaders from Kitimat, Chelsea and Brodie, Shaunhnessy. 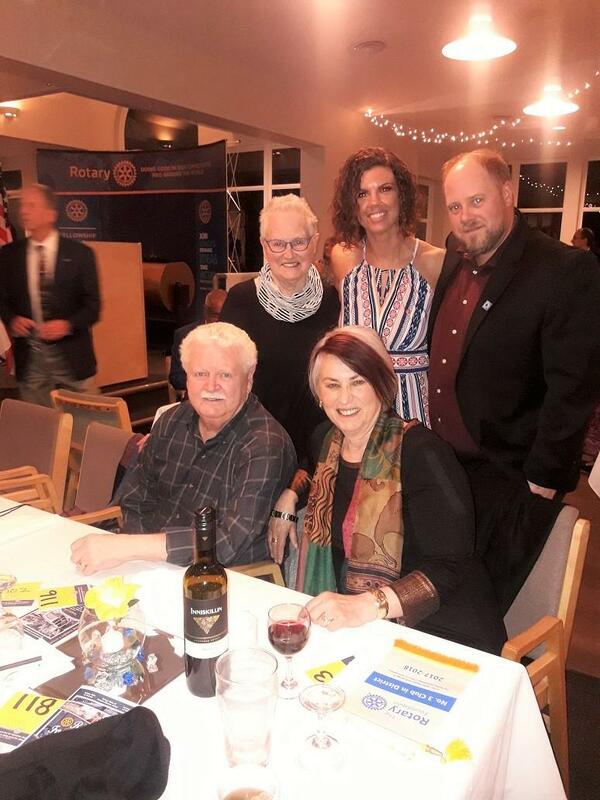 June 27th saw us opening the door to invited like-minded people, some past Rotarians, Rylarians, and active community people who share our Rotary enthusiasm for service. This sign says it all. 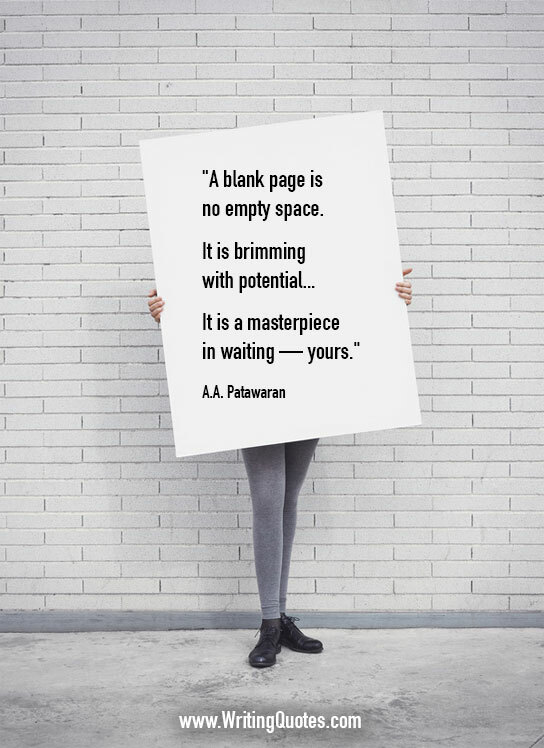 We are looking to create a masterpiece. Cheryl Rumley facilitated the evening. Thoughts and ideas flowed, answers to questions were shared. 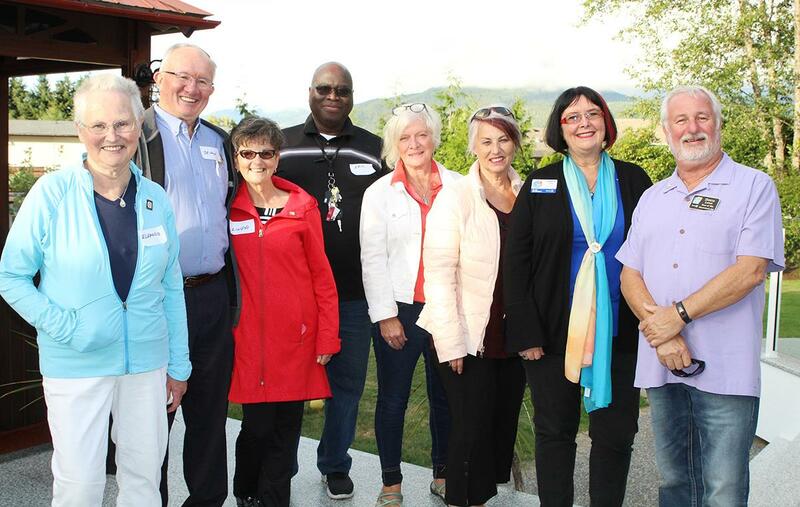 It was a beginning as we look to shape the Rotary Club of Kitimat’s vision moving into the future. Here is R.i.’s new vision.